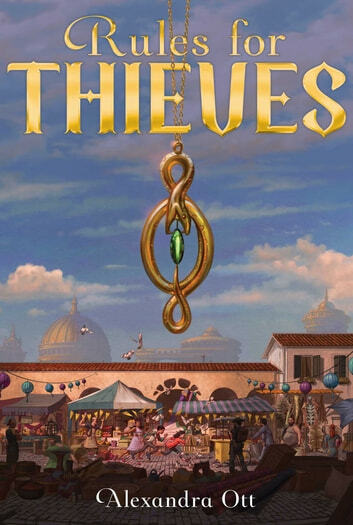 After twelve-year-old orphan, Alli Rosco, is cursed with a deadly spell, she must join the legendary Thieves Guild in order to try and save herself in this high-stakes debut. Twelve-year-old Alli Rosco is smart, resourceful, and totally incapable of keeping her mouth shut. Some of these traits have served her well during her nine years in Azeland’s orphanage, and others have proved more troublesome…but now that she’s escaped to try her luck on the streets, she has bigger problems than extra chores to contend with. Surviving would be hard enough, but after a run-in with one of the city’s Protectors, she’s marked by a curse that’s slowly working its way to her heart. There is a cure, but the cost is astronomical—and seems well out of her reach. Enter Beck, a boy with a gift for theft and a touch of magic, who seems almost too good to be true. He tells Alli that the legendary Thieves Guild, long thought to be a myth, is real. Even better, Beck is a member and thinks she could be, too. 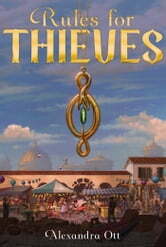 All she has to do is pass the trial that the King of Thieves will assign to her. Join the Guild, collect her yearly reward and buy a cure. Plus, Alli hopes the Guild will be the home—the family—that Alli has always wanted. But when their trial goes wrong, innocent lives are put in danger, and Alli has to decide how much she can sacrifice in order to survive. Owle, Chicken, Bear, Sparrow, and Stanley in Winter.